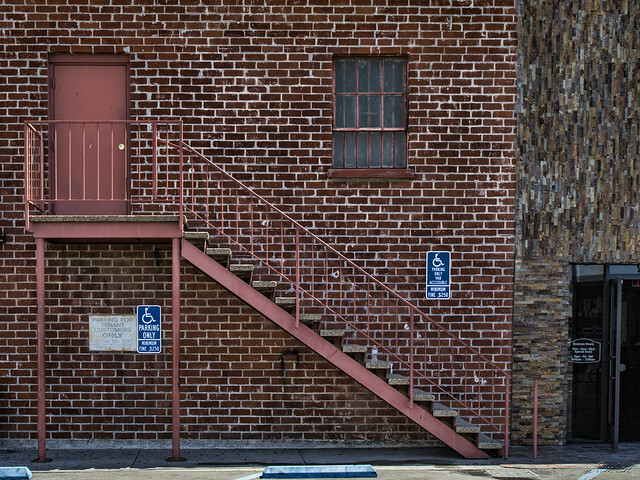 Brick is not the most common building material in southern California. This is partly because of our weather—brick holds in heat, which isn't as useful in our climate as it is elsewhere. But it's also because brick isn't very stable in an earthquake, which we have a lot of. Today's building codes require that brick be reinforced with rebar (whether on new construction or retrofitted), which makes it much more expensive than wood. But...brick is common in this little row of old retail buildings along Firestone Blvd. So why this picture? I like the look of brick and I like vintage buildings. This also is the back of the old Sears catalog store, where I got my first part-time job years ago, so there's a bit of nostalgia thrown in. "There's a certain nostalgia and romance in a place you left." Brick almost always have attractive visual patterns. I like bricks on both old and new buildings.